I'm DONE! 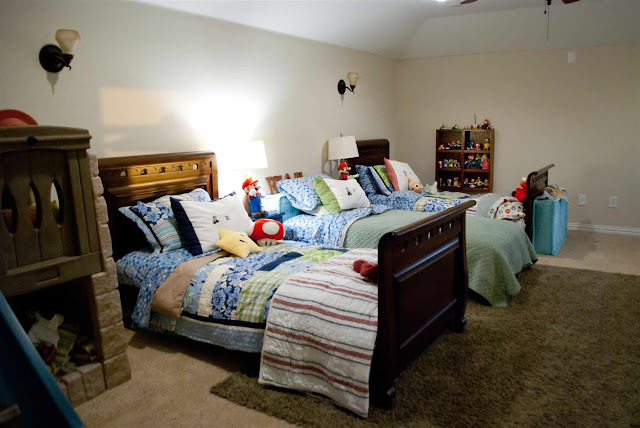 It has been quite a challenge to find the time to finish building my kiddos' beds, but I am finally finished and I LOVE how they turned out so much so that after they were put together, I sat and stared at the beds for quite some time like a total nerd. 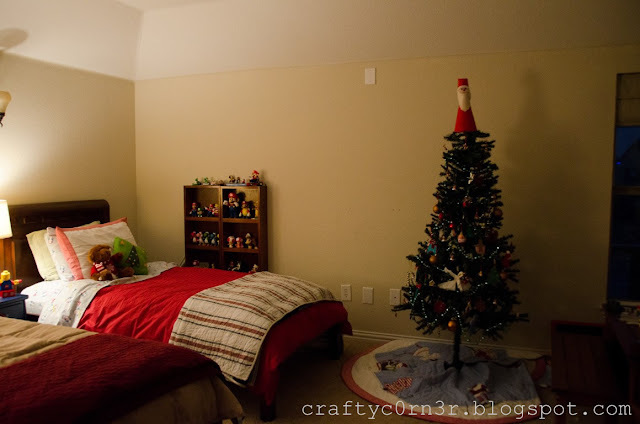 Remember this post about moving my 3 boys into one room? 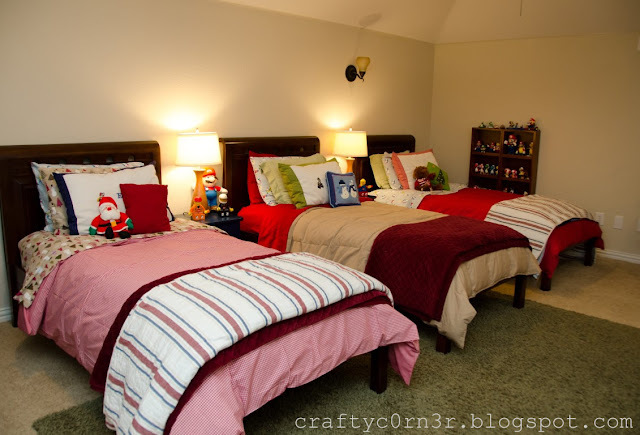 I've been wanting to build three platform beds for them since I noticed how the sleigh beds consumed the room. Those sleigh beds are really beautiful, but not for this space. 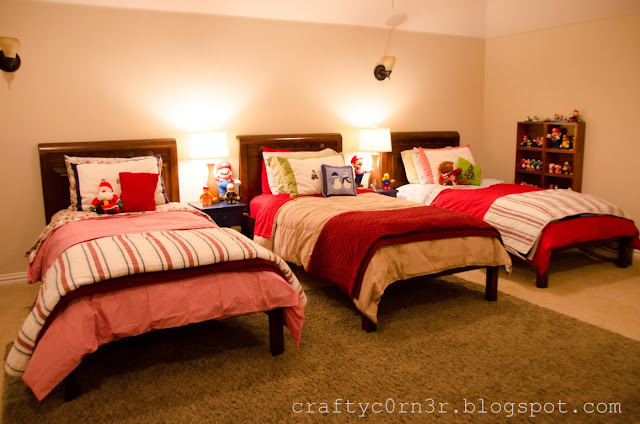 I wanted three similar, if not the same beds next to each other. 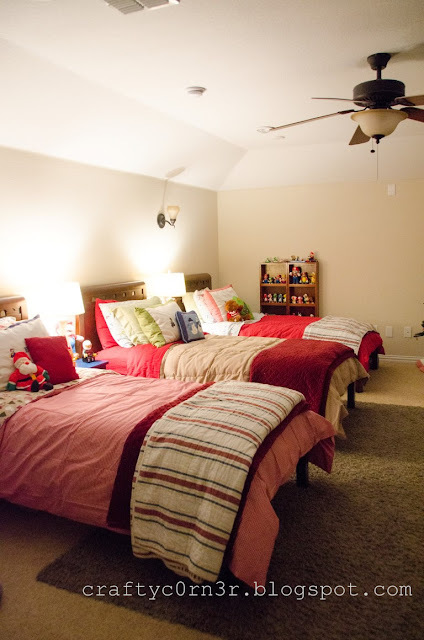 Here's what their room looked like before. It was a total mismatch. In my search for ideas, I found the Ashby bed at PB as my inspirational bed because of the sleigh head board, but it didn't have a sleigh foot board. PB has definitely been a huge inspiration in my bed building experience. 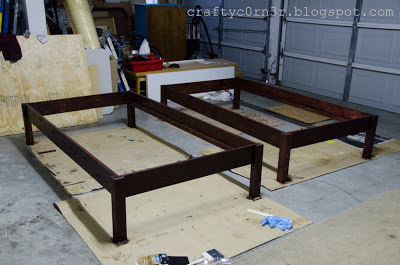 I've built their Riley bed frame and mixed it with the Thomas bed style to create my trundle bed here and I've built another PB look alike for my now guest bedroom here so I am definitely not a newbie when it comes to making a bed. What I am is indecisive. I redrew my design half a dozen times before I came to the conclusion that I was going to build the beds similar to the full bed I built last year (minus the head board). For the triple beds, I wanted to keep it simple. I decided upon 3 platform beds for several reasons. I didn't want a huge foot board. I wanted my kiddos to be able to sit at the end of their beds. The foot board also made the room feel a lot smaller. I also wanted to raise their beds so that I can build trundles underneath. My goal was to recycle what I had as much as possible (as my husband would kill me if I had to store the two unused beds in the garage). Therefore, I reused the supporting slats (beams that prevent the mattress from falling through) from their current beds. That saved me time, money and storage. I would have reused the sides as well, but I couldn't attach them to my new legs. I reused the head and foot boards. 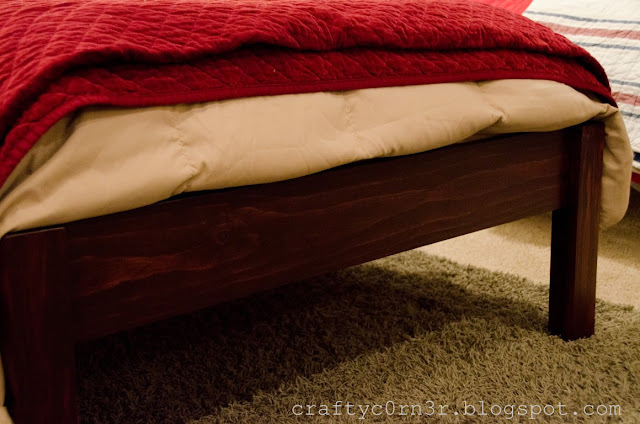 I took the foot board of one of the beds, raised it up on wooden pedestals (to add height) in order to make it into a headboard that matched the other two. 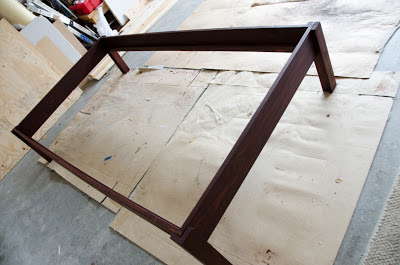 My ultimate intention was to make a new reclaimed looking headboard, but after finally figuring out how to hang that foot board into a head board so that it wouldn't topple over on R., I fell in love with the look. The new bedding I bought for the kids will have to wait a while longer before it gets used. Its winter. Hence, the Christmasy sheets (yes, we go all out with holiday bedding in all our rooms). We gotta match the Christmas tree. I forgot to turn the tree lights on for the pic. but rather it looks like this. There is still so much to do. I want to find or build new night stands, make some trundle drawers underneath their bed, and build some vintage looking storage trunks. 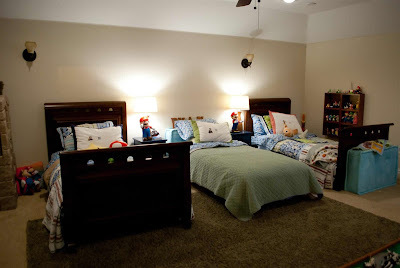 Plus, I have to install new lighting that I bought and perhaps make artwork above their beds. All this for just this side of the room. It's coming along, slowly, but surely. Baby steps....but I'm getting there.